ROCKFORD, Ill.-- The Rockford IceHogs today announced they will unveil a new alternate jersey for the 2017-18 season at a season-ticketholder event Thursday, Sept. 14 at the BMO Harris Bank Center at 6:30 p.m. 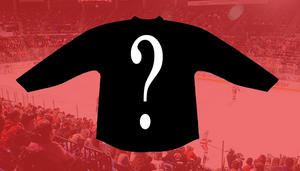 The jersey unveiling is open to the public and will also include a Q&A session with Chicago Blackhawks Senior Director of Minor League Affiliations, Mark Bernard, and new IceHogs head coach, Jeremy Colliton. As part of the festivities, the IceHogs are inviting fans to submit questions for Bernard and Colliton prior to the event, and team broadcaster Bob Mills will then ask a select group of those questions during the night's proceedings. Submissions for the Q&A session can be made through the team's Facebook page, or by emailing the IceHogs at icehogs@icehogs.com. The event will be held on the BMO arena floor, and season ticketholders can enter through the Elm St. doors, beginning at 6 p.m. The IceHogs new alternate jersey will replace the cream-colored sweaters used during the 2016-17 season. Rockford will don their new alternates in rotation with the team's traditional white and red sweaters throughout the 2017-18 campaign.